"Cherry Blossom" and "Sakura" redirect here. For other uses, see Cherry Blossom (disambiguation) and Sakura (disambiguation). A cherry blossom is a flower of several trees of genus Prunus, particularly the Japanese cherry, Prunus serrulata, which is called sakura after the Japanese (桜 or 櫻; さくら). Currently they are widely distributed, especially in the temperate zone of the Northern Hemisphere including Japan, Nepal, India, Taiwan, Korea, Mainland China, West Siberia, Iran, Myanmar and Afghanistan. Along with the chrysanthemum, the cherry blossom is considered the national flower of Japan. All varieties of cherry blossom trees produce small, unpalatable fruit or edible cherries. Edible cherries generally come from cultivars of the related species Prunus avium and Prunus cerasus. "Hanami" is the centuries-old practice of drinking under a blooming sakura or ume tree. The custom is said to have started during the Nara period (710–794), when it was ume blossoms that people admired in the beginning, but by the Heian period (794–1185) cherry blossoms came to attract more attention, and hanami was synonymous with sakura. From then on, in both waka and haiku, "flowers" (花, hana) meant "cherry blossoms". The custom was originally limited to the elite of the Imperial Court, but soon spread to samurai society and, by the Edo period, to the common people as well. Tokugawa Yoshimune planted areas of cherry blossom trees to encourage this. Under the sakura trees, people had lunch and drank sake in cheerful feasts. Every year the Japanese Meteorological Agency and the public track the sakura zensen (cherry blossom front) as it moves northward up the archipelago with the approach of warmer weather via nightly forecasts following the weather segment of news programs. The blossoming begins in Okinawa in January, and typically reaches Kyoto and Tokyo at the end of March or the beginning of April. It proceeds into areas at the higher altitudes and northward, arriving in Hokkaido a few weeks later. Japanese pay close attention to these forecasts and turn out in large numbers at parks, shrines and temples with family and friends to hold flower-viewing parties. Hanami festivals celebrate the beauty of the cherry blossom and for many are a chance to relax and enjoy the beautiful view. The custom of hanami dates back many centuries in Japan. The eighth-century chronicle Nihon Shoki (日本書紀) records hanami festivals being held as early as the third century AD. Most Japanese schools and public buildings have cherry blossom trees outside of them. Since the fiscal and school year both begin in April, in many parts of Honshu, the first day of work or school coincides with the cherry blossom season. The Japan Cherry Blossom Association developed a list of Japan's Top 100 Cherry Blossom Spots with at least one location in every prefecture. The Sakurakai or Cherry Blossom Society was the name chosen by young officers within the Imperial Japanese Army in September 1930 for their secret society established with the goal of reorganizing the state along totalitarian militaristic lines, via a military coup d'état if necessary. During World War II, the cherry blossom was used to motivate the Japanese people, to stoke nationalism and militarism among the populace. Even prior to the war, they were used in propaganda to inspire "Japanese spirit", as in the "Song of Young Japan", exulting in "warriors" who were "ready like the myriad cherry blossoms to scatter". In 1932, Akiko Yosano's poetry urged Japanese soldiers to endure sufferings in China and compared the dead soldiers to cherry blossoms. Arguments that the plans for the Battle of Leyte Gulf, involving all Japanese ships, would expose Japan to serious danger if they failed, were countered with the plea that the Navy be permitted to "bloom as flowers of death". The last message of the forces on Peleliu was "Sakura, Sakura" — cherry blossoms. Japanese pilots would paint them on the sides of their planes before embarking on a suicide mission, or even take branches of the trees with them on their missions. A cherry blossom painted on the side of the bomber symbolized the intensity and ephemerality of life; in this way, the aesthetic association was altered such that falling cherry petals came to represent the sacrifice of youth in suicide missions to honor the emperor. The first kamikaze unit had a subunit called Yamazakura or wild cherry blossom. The government even encouraged the people to believe that the souls of downed warriors were reincarnated in the blossoms. In its colonial enterprises, Imperial Japan often planted cherry trees as a means of "claiming occupied territory as Japanese space". Cherry blossoms are a prevalent symbol in Irezumi, the traditional art of Japanese tattoos. In tattoo art, cherry blossoms are often combined with other classic Japanese symbols like koi fish, dragons or tigers. It was later used for the Tokyo 2020 Paralympics mascot Someity. Prunus serrulata in Ponta Grossa, southern Brazil. The most popular variety of cherry blossom in Japan is the Somei Yoshino. Its flowers are nearly pure white, tinged with the palest pink, especially near the stem. They bloom and usually fall within a week, before the leaves come out. Therefore, the trees look nearly white from top to bottom. The variety takes its name from the village of Somei (now part of Toshima in Tokyo). It was developed in the mid- to late-19th century at the end of the Edo period and the beginning of the Meiji period. The Somei Yoshino is so widely associated with cherry blossoms that jidaigeki and other works of fiction often depict the variety in the Edo period or earlier; such depictions are anachronisms. Winter sakura or fuyuzakura (Prunus subhirtella autumnalis) begins to bloom in the fall and continues blooming sporadically throughout the winter. It is said to be a cross between edohiganzakura, the Tokyo Higan cherry (P. incisa) and mamezakura (P. pendula). Other categories include yamazakura, yaezakura, and shidarezakura. The yaezakura have large flowers, thick with rich pink petals. The shidarezakura, or weeping cherry, has branches that fall like those of a weeping willow, bearing cascades of pink flowers. Panoramic view from the Symbolic Mountain at the Japanese gardens. The view takes in the gardens and the plains of the Cowra district across to the nearby mountains. During World War II, a prisoner of war (POW) camp near the town of Cowra in New South Wales, Australia, was the site of one of the largest prison escapes of the war, on 5 August 1944. During the Cowra breakout and subsequent rounding up of POWs, four Australian soldiers and 231 Japanese soldiers died and 108 prisoners were wounded. The Japanese War Cemetery holding the dead from the Breakout was tended after the war by members of the Cowra RSL and ceded to Japan in 1963. In 1971 the Cowra Tourism Development decided to celebrate this link to Japan, and proposed a Japanese garden for the town. The Japanese government agreed to support this development as a sign of thanks for the respectful treatment of their war dead; the development also received funding from the Australian government and private entities. The garden was designed by Ken Nakajima (1914–2000), a world-renowned designer of Japanese gardens at the time. The first stage was opened in 1979, and a second stage in 1986. The gardens were designed in the style of the Edo period and are a kaiyū-shiki or strolling garden. They are designed to show all of the landscape types of Japan. At five hectares (12 acres), the Cowra Japanese Garden is the largest Japanese garden in the Southern Hemisphere. An annual cherry blossom festival during September is now a major event in Cowra's tourism calendar. With the Japanese diaspora to Brazil, many immigrants brought seedlings of cherry trees. In São Paulo State, home to the largest Japanese community outside Japan, it is common to find them in Japan-related facilities and in some homes, usually of the cultivars Prunus serrulata 'Yukiwari' and Prunus serrulata var. lannesiana 'Himalaya'. Some cities, as Garça and Campos do Jordão, have annual festivals to celebrate the blooming of the trees and the Japanese culture. In the Parana State (in southern Brazil), many cities received many of these immigrants, who planted the trees, as in Apucarana, Maringá, Cascavel and especially in the capital city of Curitiba. In the capital city of Paraná, the first seedlings were brought by Japanese immigrants in the first half of the 20th century, but large quantities of them were only planted from the 1990s, with the opening of the Botanical Garden of Curitiba. Nowadays the seedlings are produced locally and used in afforestation of streets and squares – as in the Japanese Square, where there are more than 30 cherry trees around the square which were sent by the Japanese Empire to Curitiba. Vancouver, British Columbia is famous for its thousands of cherry trees (estimated 50,000) lining many streets and in many parks, including Queen Elizabeth Park and Stanley Park. Vancouver holds the Vancouver Cherry Blossom Festival every year. With multiple varieties and a temperate climate, they begin to bloom in February yearly and peak in April. High Park in Toronto, Ontario features many Somei-Yoshino cherry trees (the earliest species to bloom and much loved by the Japanese for their fluffy white flowers) that were given to Toronto by Japan in 1959. Through the Sakura Project, the Japanese Consulate donated a further 34 cherry trees to High Park in 2001, plus cherry trees to various other locations like Exhibition Place, McMaster University, York University (near Calumet College and on Ottawa Road near McLaughlin College) and the University of Toronto's main (next to Robarts Library) and Scarborough campuses. Niagara Falls also has many near the Falls itself. Royal Botanical Gardens in Burlington and Hamilton was also the recipient of a number of Somei-Yoshino cherry trees that were donated by the Consulate-General of Japan in Toronto as part of the Sakura Project. The trees are located in the Arboretum and the Rock Garden and were planted to celebrate the continual strengthening of friendship between Japan and Canada. Peak bloom time at Royal Botanical Gardens is normally around the last week of April or the first week of May. Cherry trees naturally grow in the middle northern or southern part of China, the area nearby the sea. However, some of the most famous cherry blossom parks in China reflect Japan's brief occupation of parts of China during the first half of the 20th century or the donation from Japan thereafter or prior: a notable example is at Qinglong Temple - Xi’an. Cherry Blossom orchards were brought in by the Japanese monk Kukai in 806CE as a gift to commemorate his time as a student at the temple. Parc de Sceaux, located in a suburb of Paris, has two orchards of cherry trees, one for white cherry blossoms (Prunus avium) and one for pink cherry blossoms (Prunus serrulata), the latter with about 150 trees that attract many visitors when they bloom in early April. The cherry blossom is a major tourist attraction in Germany's Altes Land orchard region. The largest Hanami in Germany, in Hamburg, with Japanese-style fireworks, organized by the German-Japanese society, draws tens of thousands spectators every spring. Starting in 2015, Hamburg will be allowed to bestow the title of "Cherry Blossom Queen" by the Japan Cherry Blossom Association, one of only three cities worldwide to receive this privilege. The first Cherry Blossom Queen of Hamburg will be crowned by the Cherry Blossom Queen of Japan on 23 May. In 1990, along prior sections of the Berlin Wall, Japan donated cherry blossoms to express appreciation of German reunification. The gift was supported by donations from the Japanese people allowing for over 9,000 trees to be planted. The first trees were planted in November of that year near Glienicker Bridge. The Cherry Blossom festival in the Bonn Altstadt is also very famous: Kirschblütenfest Bonn [de]. In India, the cherry blossom is an attraction as well, most notably in Himalayan states like Himachal Pradesh, Uttarakhand, Jammu & Kashmir, Sikkim & northern districts of West Bengal namely Jalpaiguri and Darjeeling. Temple towns like Kalpa, Sarahan, Chitkul, Sangla and Narkanda are notable for their wild cherry blossom during spring covering Himalayan foothills. They can also be seen in various British-era botanical gardens especially in Nilgiri Hills, Garo Hills, Khasi Hills as well as in some hill stations in the Western Ghats. Prunus cerasoides, called wild Himalayan cherry and sour cherry, and known in Hindi as padma or padmakashtha, is found in parts of East, South and Southeast Asia. Recently Kolkata municipal department and the forest department planted cherry blossoms across main city places like Rajarhat. They were in full bloom the first week of March 2017. Cherry trees have been used in Korea for a long time. It has been used in making bows and woodblocks(Palman Daejanggyeong). According to tradition, monks used wood from silver magnolias, white birches and cherry trees from the Southern coast of the peninsula. The origins of cherry blossoms in South Korea is contentious. The Japanese planted Yoshino cherry trees at Seoul's Changgyeonggung Palace and the viewing of cherry blossoms was introduced to Korea during Japanese rule. The festivals continued even after the Japanese surrendered at the end of WWII but have been controversial, and many cherry trees were cut down to celebrate the fiftieth anniversary of the Japanese surrender because they were seen as symbols of the occupation. Yet Koreans continued to plant Yoshino cherry trees and festivals began attracting a wide range of tourists. Many Korean media assert that the Yoshino cherry is the same species as a Korean indigenous, endangered species called King cherry, whose mass production is still being studied.And Korean is insisting "Japan stole a cherry tree from Korea." But,In 2007, a study conducted on the comparison of King cherry and Yoshino cherry concluded that these trees were categorized as distinct species.It was proved that Korean insistence is a false. In 2016, a study on DNA analyses suggested the independent origin between King cherry and yoshino cherry each other. In 2016, a new scientific name Cerasus × nudiflora was given to King cherry to distinguish it from Yoshino cherry (Prunus × yedoensis). In Korea most of the places for cherry blossom festivals, including Yeouido and Jinhae, are still planted with Yoshino cherry trees. In Korea, cherry blossoms have the meaning of purity and beauty. Cherry blossoms are part of the attraction of the temperate regions of the country. The town Pyin Oo Lwin, known as "The Land of Cherries", is famous for its cherry blossoms during the spring. Some cherry trees, genetically modified to be able to survive in the tropical weather, were also planted in Yangon, the commercial capital, as a part of the friendship program with Japan. In the year 2000, the Japan Women's Club (JWC) donated 400 cherry blossom trees to the city of Amstelveen. The trees have been planted in the cherry blossom park in the Amsterdamse Bos. A special detail is that every tree has a name — 200 trees have female Japanese names, 200 trees have female Dutch names. Hagley Park is the largest urban open space in Christchurch, New Zealand and has many cherry blossom trees of several varieties. Typically found in mountainous areas, cherry blossoms are a popular attraction in Taiwan, with numerous specially tailored viewing tours. Among the most easily accessible and thus most popular locations for viewing them are Yangmingshan, in Taipei, and Wuling Farm, in Taichung. Cherry blossoms are found in Northern Thailand. 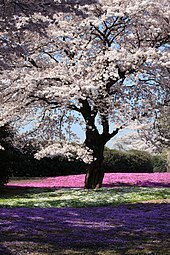 In 2005, Japanese cherry trees were presented by Japan to the Nezahat Gökyiğit Botanical Garden in Istanbul, Turkey. Each tree represents one sailor of the frigate Ertogrul which was a famous frigate of the Ottoman Turkish navy. On the way back from a goodwill visit to Japan in 1890 she ran into a typhoon and sank with loss of 587 Ottoman Turkish sailors. That loss is being remembered at every anniversary. The Japanese cherry trees represent memory of those who died and provide remembrance. Batsford Arboretum in Gloucestershire (England), holds the national collection of Japanese village cherries, sato-sakura group. Keele University in Staffordshire (England), has one of the UK's largest collections of flowering cherries, with more than 150 varieties. Japan gave 3,020 cherry blossom trees as a gift to the United States in 1912 to celebrate the nations' growing friendship, replacing an earlier gift of 2,000 trees which had to be destroyed due to disease in 1910. These trees were planted in Sakura Park in Manhattan and line the shore of the Tidal Basin and the roadway in East Potomac Park in Washington, D.C. The first two original trees were planted by first lady Helen Taft and Viscountess Chinda on the bank of the Tidal Basin. The gift was renewed with another 3,800 trees in 1965. In Washington, D.C. the cherry blossom trees continue to be a popular tourist attraction (and the subject of the annual National Cherry Blossom Festival) when they reach full bloom in early spring. Just outside of Washington, D.C., the suburb of Kenwood in Bethesda, Maryland has roughly 1,200 trees that are popular with locals and tourists. New Jersey's Branch Brook Park, which is maintained by Essex County, is the oldest county park in the United States and is home to the nation's largest collection of cherry blossom trees, with about 5,000. Also, Balboa Park of San Diego has 2,000 cherry blossom trees that blossom in mid to late March. In Los Angeles, over 2,000 trees are located at Lake Balboa in Van Nuys. These trees were donated by an anonymous Japanese benefactor and were planted in 1992. They originated from a single parent tree and were developed to grow in warm climates. Philadelphia is also home to over 2,000 flowering Japanese cherry trees, half of which were a gift from the Japanese government in 1926 in honor of the 150th anniversary of American independence, with the other half planted by the Japan America Society of Greater Philadelphia between 1998 and 2007. Philadelphia's cherry blossoms are located within Fairmount Park, and the annual Subaru Cherry Blossom Festival of Greater Philadelphia celebrates the blooming trees. The University of Washington in Seattle also has cherry blossoms in its Quad. Other US cities have an annual cherry blossom festival (or sakura matsuri), including the International Cherry Blossom Festival in Macon, Georgia, which features over 300,000 cherry trees. The Brooklyn Botanic Garden in New York City also has a large, well-attended festival. Portsmouth, New Hampshire, is the site of the peace conference that produced the Treaty of Portsmouth, for which the original Washington, DC cherry trees were given in thanks. Several cherry trees planted on the bank of the tidal pond next to Portsmouth City Hall were the gift of Portsmouth's Japanese sister city of Nichinan—the hometown of Marquis Komura Jutarō, Japan's representative at the conference. Ohio University in Athens, Ohio, has 200 somei yoshino trees, a gift from its sister institution, Japan's Chubu University. The blossoms are pickled in salt and umezu (ume vinegar), and used for coaxing out flavor in wagashi, (a traditional Japanese confectionery,) or anpan, (a Japanese sweet bun, most-commonly filled with red bean paste). Salt-pickled blossoms in hot water are called sakurayu, and drunk at festive events like weddings in place of green tea. The leaves, mostly from the Ōshima cherry because of the softness, are also pickled in salted water and used for sakuramochi. Since the leaves contain coumarin, which is toxic in large doses, it is not recommended to eat them in great quantities. ^ The history and cultural symbolism of both the seven wild species and the hundreds of forms known for centuries as sato-zakura, or garden cherries and information about growing and propagating is found in Kuitert, Wybe (6 March 2015). "Japanese Flowering Cherries". Timber Press. ^ "財団法人　日本花の会 — The Flower Association of Japan". hananokai.or.jp. Archived from the original on 5 August 2014. ^ "さくらの基礎知識 - 公益財団法人　日本さくらの会 — JAPAN Cherry Blossom Association". sakuranokai.or.jp. ^ "STUDIES ON THE HISTORY OF FLOWERING CHERRY--《Journal of Nanjing Forestry University》1982年02期". en.cnki.com.cn. Retrieved 2019-04-09. ^ Honoca. "The beauty and history of sakura, Japan's national flower". Tsunagu Japa. Retrieved 6 January 2016. ^ Brooklyn Botanic Garden (2006). Mizue Sawano: The Art of the Cherry Tree. Brooklyn Botanic Garden. p. 12. ISBN 978-1-889538-25-9. ^ "Japan's Top 100 Cherry Blossom Spots – GoJapanGo (English language version of list)". Japan's Top 100 Cherry Blossom Spots – GoJapanGo. Mi Marketing Pty Ltd. Retrieved 9 November 2011. ^ a b Choy Lee, Khoon. Japan—between Myth and Reality. 1995, page 142. ^ Young, John and Nakajima-Okano, Kimiko. Learn Japanese: New College Text. 1985, page 268. ^ a b Slaymaker, Douglas. The Body in Postwar Japanese Fiction. 2004, page 122. ^ a b c d e Ohnuki-Tierney, Emiko. Kamikaze, Cherry Blossoms, and Nationalisms. 2002, page 9-10. ^ Sakamoto, Kerri: One Hundred Million Hearts. Vintage Book, 2004. ISBN 0-676-97512-7. ^ "Cherry Blossom Tattoo Designs". Freetattoodesigns.org. Retrieved 2013-06-14. ^ Kato, Shuri; Matsumoto, Asako; Yoshimura, Kensuke; Katsuki, Toshio; Iwamoto, Kojiro; Kawahara, Takayuki; Mukai, Yuzuru; Tsuda, Yoshiaki; Ishio, Shogo; Nakamura, Kentaro; Moriwaki, Kazuo; Shiroishi, Toshihiko; Gojobori, Takashi; Yoshimaru, Hiroshi (2014). "Origins of Japanese flowering cherry (Prunus subgenus Cerasus) cultivars revealed using nuclear SSR markers" (PDF). Tree Genetics & Genomes. 10 (3): 477–487. doi:10.1007/s11295-014-0697-1. Retrieved 2019-02-11. ^ Kato, Shuri; Matsumoto, Asako; Yoshimura, Kensuke; Katsuki, Toshio; Iwamoto, Kojiro; Tsuda, Yoshiaki; Ishio, Shogo; Nakamura, Kentaro; Moriwaki, Kazuo; Shiroishi, Toshihiko; Gojobori, Takashi; Yoshimaru, Hiroshi (2012). "Clone identification in Japanese flowering cherry (Prunus subgenus Cerasus) cultivars using nuclear SSR markers". Breeding Science. 62 (3): 248–255. doi:10.1270/jsbbs.62.248. PMC 3501942. PMID 23226085. ^ "The observation of flowering dates in the Cherry Preservation Forest at the Tama Forest Science Garden over a 30 year period" (PDF). ^ "Winter-flowering cherry". Retrieved 1 January 2008. ^ "Festa da Cerejeira em Garça recebe mais de 150 mil visitantes" (in Portuguese). TV TEM. 7 July 2014. Retrieved 7 July 2015. ^ "Festa da Cerejeira em Flor 2014 celebra a Cultura do Japão em Campos do Jordão" (in Portuguese). Guia de Campos do Jordão. Archived from the original on 7 July 2015. Retrieved 7 July 2015. ^ "Cerejeiras enfeitam cidade no norte do Paraná" (in Portuguese). Jornal Nacional. Retrieved 2011-07-15. ^ "Cerejeiras enfeitam Cascavel" (in Portuguese). Globo Vídeos. Retrieved 2011-07-15. ^ a b "Temporada das Cerejeiras em Curitiba" (in Portuguese). Diário Urbano. Retrieved 2011-07-15. ^ "Novo colorido em parques e praças" (in Portuguese). Prefeitura de Curitiba. Retrieved 2011-07-15. ^ "Japan Square". Prefeitura de Curitiba. Retrieved 2011-07-15. ^ "Vancouver Cherry Blossom Festival – VCBF.CA". vcbf.ca. Retrieved 26 April 2010. ^ "10 Best Places to Enjoy Cherry Blossoms in China". www.careerchina.com. Retrieved 2019-04-01. ^ "Aktuelles aus der Gesellschaft". Deutsch-Japanische Gesellschaft zu Hamburg e.V. Retrieved 2015-04-25. ^ "The Sakura Campaign - The State of Berlin". Berlin.de. Retrieved 2 April 2017. ^ "Cherry Blossoms in Shillong". mapsofindia.com. ^ "Prunus cerasoides". Germplasm Resources Information Network (GRIN). Agricultural Research Service (ARS), United States Department of Agriculture (USDA). Retrieved 24 January 2014. ^ Navendu Pāgé. "Cerasus cerasoids – Wild Himalayan Cherry". Flowers of India. Retrieved 9 July 2014. ^ A History of Tripitaka Koreana, the World's Greatest Collection of Buddhist Scriptures. ^ 팔만대장경을 만들어 낸 우리나무, 벚나무 [cherry tree which made the Palman Daejanggyeong](in korean). ^ 가슴과 어깨에 벚꽃을 꽂고 희생 다짐하는 18세 조종사 (in Korean). Joongang. Retrieved 2009-01-03. ^ Ohnuki-Tierney, Emiko. Kamikaze, Cherry Blossoms, and Nationalisms. 2002, page 122-3. ^ Choi Sung-Un (2008). "Biting the cherry: Cherry blossoms and their attendant festivals herald the spring in Korea despite associations with a dark chapter with the country's history". IK-Journal. Archived from the original on 8 October 2011. Retrieved 2009-11-30. ^ "전국 봄꽃 축제 어디로 갈까?" [National spring flower Festival, Where to go?]. Dong-a Ilbo. 23 March 2017. ^ "왕벚꽃 100년 논란 "제주가 진짜 원산지"" [King cherry 100 years controversy "Jeju is the real origin"]. Yonhapnews. 26 March 2017. ^ Korean Red List of Threatened Species Second Edition (PDF). National Institute of Biological Resources. 2014. p. 156. Prunus × yedoensis Matsumura, Rosales: Rosaceae, Prunus × yedoensis is a deciduous tree endemic to Korea that only about 5 populations occur at Mt. Halla in Jeju-do. The estimated number of individuals is very small. This species is found in deciduous broadleaf forests at 450-900 m above sea level. The species is assessed as EN B2ab(iv). There are currently no regional conservation measures. ^ Kim, Chan-Soo (2009). "Vascular Plant Diversity of Jeju Island, Korea" (PDF). Korean Journal of Plant Resources. 22 (6): 558～570. ^ 몰락한 왕조 궁궐에 핀 사쿠라 일제는 갔어도 벚꽃놀이는 남아 (in Korean). 中央日報. 19 April 2009. Retrieved 2009-05-11. ^ Cho, Myong-suk; et al. (2016). "The origin of flowering cherry on oceanic islands: The saga continues in Jeju Island". Botany. Archived from the original on 2 April 2017. ^ Katsuki, Toshio; et al. (December 2016). "Nomenclature of Tokyo cherry (Cerasus × yedoensis 'Somei-yoshino', Rosaceae) and allied interspecific hybrids based on recent advances in population genetics". Taxon. 65 (6): 1415–1419. doi:10.12705/656.13. ^ "[단독]여의도 화려한 벚꽃뒤엔…일본 검은 속셈 있었나" [Behind the brilliant Japanese cherry blossom – Dark ulterior motives?] (in Korean). Segye.com. 22 January 2008. ... From 1966 until the mid-1980s, Koreans in Japan and Japanese people donated about 60,000 cherry seedlings to Jinhae City. ^ "때되면 한-일 원산지 논쟁, 벚꽃에게 물어봐!" [Korea-Japan Origin debate. Ask cherry!]. The Hankyoreh. 3 April 2015. ^ "한라산 자생 우수품종 왕벚나무로 일본산 대체한다" [Replace Japanese trees with the excellent varieties of King cherry trees native to Mt. Halla]. Yonhapnews. 4 April 2017. ^ "Cherry Blossom". naver dictionary. ^ "5 Most Beautiful Myanmar Flowers | Sanctum Inle Resort". sanctum-inle-resort.com. Retrieved 2019-04-09. ^ "Pyin Oo Lwin Myanmar's Highland City of Flowers". www.pyinoolwin.info. Retrieved 2019-04-08. ^ "Beautiful Weather and cherry blossom season - Review of Maymyo Botanical Garden (National Kandawgyi Park), Pyin Oo Lwin (Maymyo), Myanmar". TripAdvisor. Retrieved 2019-04-09. ^ "Japanese cherry tree begins to blossom at Yangon Region Hluttaw". Global New Light Of Myanmar. 2019-02-08. Retrieved 2019-04-09. ^ "Spring blossoms in Hagley Park Christchurch". New Zealand Travel Insider. ^ "Northern Thailand's Own Sakura Cherry Blossoms". Siam and Beyond. 11 January 2014. ^ "Batsford Arboretum". Batsarb.co.uk. Retrieved 2009-11-30. ^ "Keele University Arboretum flowering cherry collection". keele.ac.uk. Retrieved 2011-03-28. ^ "nps.gov – Cherry Blossom History". Retrieved 13 January 2009. ^ Jefferson, Roland M. and Alan F. Fusonie. (1977). 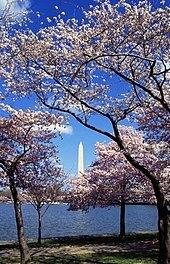 "The Japanese Flowering Cherry Trees of Washington, D.C.: A Living Symbol of Friendship. National Arboretum Contribution No. 4." Washington: USDA, Agricultural Research Service. ^ "The Nation's Greatest Springtime Celebration". National Cherry Blossom Festival. Retrieved 2013-06-14. ^ Block, Deborah. "Spectacular Cherry Blossoms in Maryland Lure International Visitors". VOA. Retrieved 2016-03-24. ^ "Student scientists track nation's largest collection of cherry blossom trees at Essex County park". The Star-Ledger. 13 August 2010. Retrieved 2012-04-10. ^ Hinds, Kate (25 March 2012). "Cherry Blossom Trees Flourish in Newark". WNYC. Archived from the original on 31 March 2012. Retrieved 10 April 2012. ^ "BBG.org". BBG.org. 26 April 2008. Retrieved 2013-06-14. ^ Stephanie Seacord. "Cherry trees have historical significance". SeacoastOnline.com. Retrieved 2013-06-14. ^ "Ohio University Outlook". Ohio.edu. Retrieved 2013-06-14. Wikimedia Commons has media related to Prunus in flower. Vancouver Cherry Blossom Festival, Information about the 37,000 cherry trees in Greater Vancouver (Canada), What's in bloom now, Cherry Scout reports and maps, Cultivar identification. Subaru Cherry Blossom Festival of Greater Philadelphia, Information about cherry trees and the annual two-week Subaru Cherry Blossom Festival of Greater Philadelphia.